The mountains of Western North Carolina famously beckon tourists. 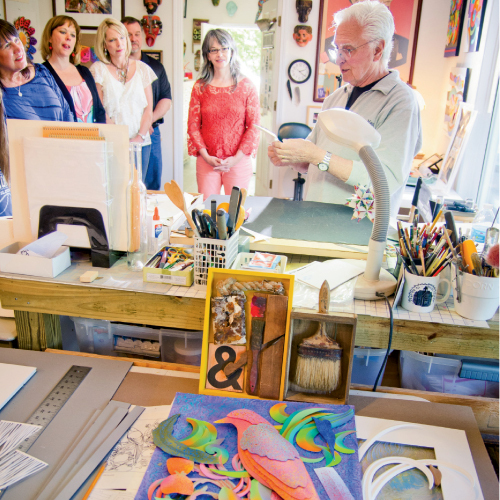 To artists, they seem to whisper “stay.” Sherry Masters has found a way to bring visitors to artists’ studios in off-the-beaten-path, breathtaking places around the region through her tour business, Art Connections, which debuted last year. Masters managed Grovewood Gallery in Asheville for 20 years, during which time the gallery gained recognition as one of the nation’s top craft retailers. She also served as the local coordinator for American Craft Week. Masters’ motivation for starting Art Connections was sparked by her passion for supporting local makers. “With all the interest in objects made in America and the buy-local movement, the tour offers an in-depth survey of the fine quality work being produced here,” she says. Masters designs the tours, which travel by van from a departure point at the Asheville Area Chamber of Commerce, to include both leading and emerging artists working in a range of media, from clay to wood to glass. The jaunts are scheduled once a month this summer and fall, and Masters also offers custom tours by request. In July, the tour will be held the weekend of the Craft Fair of the Southern Highlands and will visit three local painters. In August, a ceramics tour of six studios is timed to coincide with the annual Penland School of Crafts Auction. Many of the studios along the tour are in locations of startling beauty. Rolling down the back roads of Canton, Celo, Saluda, or Waynesville, and coming upon a tucked-away studio, where an exquisite object is being made, is a delight in itself, an artful experience to take home and treasure. Masters hopes visitors will come home with handmade reminders of the experience, too. 10 a.m.-1 p.m. & 2-5 p.m.